You’ve probably noticed the dawn chorus getting louder at this time of year. We certainly have as our parks provide a safe haven for many types of wildlife, especially birds. Here’s an update on our visitors of the feathered variety. International Dawn Chorus Day is on Sunday 5 May. 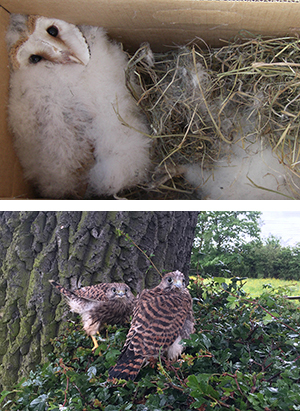 York Caravan Park has kestrels nesting at the site every year. They also have barn owls and plenty of bird boxes for small birds to nest. At Overbrook Caravan Park, a number of birds frequent the park and the beck (small river), including kingfishers, egrets, herons, Lesser Spotted Woodpeckers, treecreepers, hawks and owls. Lamb Cottage Caravan Park set in the beautiful Cheshire countryside is surrounded by lots of local wildlife. Sparrowhawks and Great Spotted Woodpeckers are often seen on the park. Grooby’s Pit is regularly visited by kingfishers, owls, kestrels, hawks, swans, wild geese and parakeets that have escaped from a nearby wildlife centre. Just outside Skegness is Gibraltar Point National Nature Reserve with a visitor centre (12 miles from the park). This reserve covers unspoilt coastline from the edge of Skegness to the mouth of the Wash. Known for its impressive views and vast diversity of wildlife, Gibraltar Point is well worth a visit in every season. In spring, the first of the migrants stop off here to refuel or establish territories. Longnor Wood Holiday Park enjoys a very vocal dawn chorus. The park is visited by a wide variety of birds including sparrowhawks, one of which flew into a lodge last year and sat in the office while it recovered! At Red Kite Touring Park there’s an owl box in use. As you’d expect, Red Kites are around, but there’s also a rare White Red Kite frequenting the park (there’s only about a six of these birds in Wales). New Lodge Farm is less than a mile away from Fineshade Wood, part of Rockingham Forest, one of the two national sites that began the reintroduction of Red Kites to the UK back in 2000. Every day Kites can be seen gliding and swooping over the campsite. In Laxton Village, less than half a mile walk away from the park, a feeding station has been established and you can see 50 to 100 Kites at a time circling around to be fed at about 3.30pm every afternoon! Bath Chew Valley Caravan Park has reported some very exciting visitors in the area with more sightings of ospreys in transit around the lakes. The Great Egrets (the metre high white heron-like waders) are still around and look as if they’re intending to stay. Over at Greenacres Touring Park near Wellington, you can now hear the dawn chorus on the park and there are also rabbits playing and running around the park. Old Oaks Touring Camping & Glamping is teaming with wildlife and birds. There are plenty of bird tables sited around the park and the ‘borrow a bird feeder’ scheme ensures that birdlife is prolific throughout the year. You can also borrow a bat detector free of charge. Somerset has many nature reserves and most of them are very close to Old Oaks, including Westhay Moor Nature Reserve, Shapwick Heath, RSPB Ham Wall and Catcott Complex. Guests at Back of Beyond Touring Park are now sitting out to enjoy the dawn chorus. With 18 acres of woodland on site, plus lakes and a river in an SSSI, the park provides many birds with a home or pit-stop. There’s a wide selection of garden birds, plus woodpeckers, kingfishers, herons, wagtails, owls and some very friendly robins. There’s a local New Forest Dawn Chorus guided walk on 4 May. See details. Woodland Springs Touring Park has reported a massive dawn chorus on site with over 45 species of birds seen on the park. You can currently hear the calls of tawny and barn owls and the robins are very brave – be careful or they will come inside to visit! The park also has nesting buzzards in the woods and there are a great many other species including woodpeckers and treecreepers, which have become very brave now, especially if you put out feeders – a very quick and easy way to give yourself a view to die for with so many birds coming to dine.